rif decided to go to Tony Roma for dinner last Wednesday. Since it was Raya, the place wasn’t as packed as its usual and we got a seat in 10 minutes. We ordered a full onion loaf as a start. The waiter thought I was joking when I said “Full”. He told me that full portion was meant to be shared between 6-7 people. 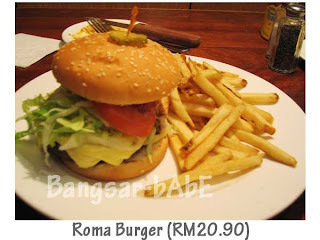 o_0 For mains, I had the Roma burger while rif took the Chicken Swiss Sandwich. The onion loaf was coated in light batter before deep-fried and served with tartar sauce. The onions were tender while crispy and light on the outside. I found this quite tasty, but I’m quite biased when it comes to onion rings. I absolutely love onion rings. 😀 We finished the whole plate, and my waiter was amused. The complimentary bread roll was average. I only liked the garlic butter that came in the shape of a ball. Interesting, but nothing great. My roma burger looked promising. Made from fresh ingredients, the patty was juicy and done “medium”, just the way I like it. However, my joy was shortlived. The patty was bland, I had to use a liberal amount of chili sauce to flavour it. Even the cheese was bland and the bun had no crispy edges. The fries were floppy and pale-looking. A far cry from the thick cut fries at Chilis. rif’s sandwich was worst. At the very least, my patty was juicy. His chicken was dry, hard and chewy. Any drier it could pass of as chicken jerky. To make matters worst, the rubber hard chicken was topped with bland cheese and chewy bacon strips. The special lemon mustard sauce could do nothing to save it. 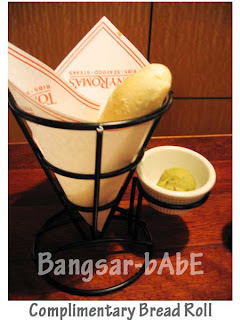 The only thing commendable about my dining at Tony Roma was the good service. The waiters were polite and friendly. They often walked by to see if we needed anything else. I thought that the 10% service charge was well-deserved. Our meal came up to RM 69.80 inclusive of tax and service charge. Verdict: Mediocre food, good service. 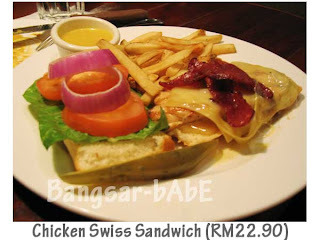 Try the onion loaf, but skip the Chicken Swiss Sandwich. dun bother with the sandwiches..from the look of it..
but the beef ribs is abt the most satisfying thing i can get out from these place..(although not the real thing)..